A killer, motivated by ideological passions, enters a house of worship and launches a frenzied attack that results in a great deal of spilled blood, numerous deaths of the faithful, and devastated families. It's terrorism, right? Well, that depends on who's doing the editing. The murders of unarmed Jewish worshipers are described as a "frenzied assault", the most lethal incident in the city (Jerusalem) in years. But the word 'terror' appears only when it's part of a direct quotation from comments made by two people: an eye-witness and the US Secretary of State. Terrorism not mentioned. 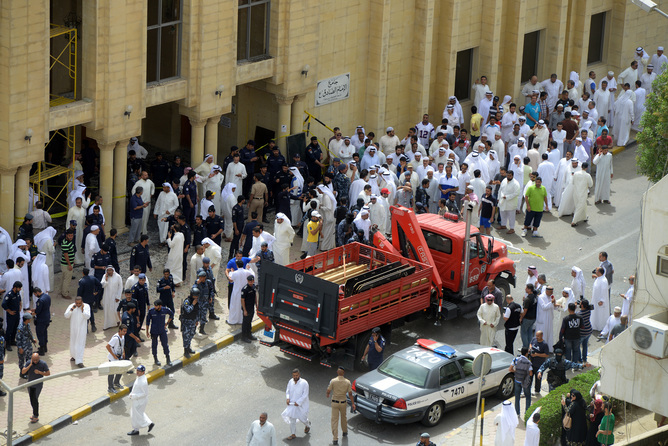 The attackers are termed "assailants", the massacre is an "attack" and an "assault". The savagery is framed as part of "the rising religious dimension of the spate of violence, which has been attributed mainly to a struggle over the very site the victims were praying toward". Does the reporter see the victims as part of that "spate"? Were the men at prayer involved in a "struggle"? Are any Israelis to be considered outside that struggle? 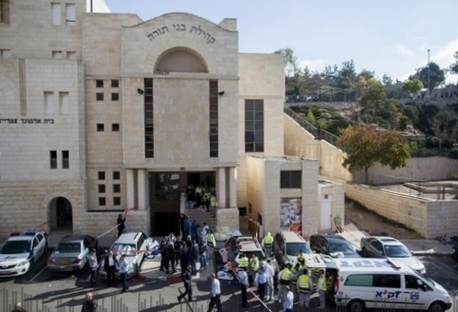 Two "assailants" attacked worshipers (knives, axes, pistol) in a Jerusalem synagogue. "Spokeswoman Luba Samri described the incident as a "terrorist attack."" But other than as part of a quote from the police, terror goes unmentioned... except in the URL of the article itself, which suggests someone with more brains than political correctness realized what the massacre in Jerusalem actually stood for, but was then editorially over-ruled. "A bloody assault in Tunisia, a decapitation in France and a suicide bombing in Kuwait are part of the horrifying new normal of terrorism"
Terrorism is never mentioned other than as part of someone's quoted words. "Tuesday’s attack in a crowded synagogue where worshippers has just begun their morning prayers is the most serious attack in recent weeks. Both Israelis and Palestinians noted the choice of target and the skyrocketing tensions over Jerusalem’s holy sites – the Temple Mount or Noble Sanctuary houses the Dome of the Rock and the Al-Aqsa Mosque, and has the Western Wall at its base. Many expressed concerns that this may be morphing into a religious war more than a struggle over land." True to Reuters policy, its editors manage to tell the story of Friday's massacre in the Kuwait mosque as well as the November 2014 massacre in the Jerusalem synagogue with no mention of terror in either case. So does this mean we are closer to a solution? Are we better off this way? Is there anything we can learn from this? Stay tuned.